It’s somewhat late to plant most tropicals this month, except in coastal zones. 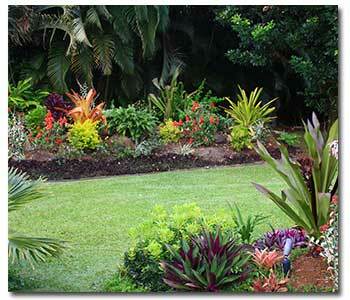 Among tropicals that can be planted along the coast now (or during any summer month) are papayas, bananas, and palms. Papayas (Carica) and bananas (Musa, Ensete) will grow and bear fruit in all frost-free zones, but they do best near the coast and thrive on sheltered, south-facing hillsides. Papayas are tall, single-trunked, succulent trees with a palm-like cluster of leaves on top. It’s a common misconception that bananas, like papayas, grow on trees, but they actually grow on a large, green, herbaceous, perennial plant. The apparent trunk of a banana plant is actually formed of a group of leaf stalks. Surprisingly, the fruits themselves are technically berries. If you compost papaya skins and seeds, many papaya plants will come up here and there during the summer. Look for these seedlings now and plant a group of three to five of them in full sun, 4 to 6 feet apart. (You need both male and female plants to get fruit.) Feed your papayas for growth and provide them with good drainage and plenty of water. Or start papaya seeds in flats. For the quickest germination, rub a handful of seeds gently on a piece of screen under running water to remove the aril (the protective seed covering). Sprout the seeds in the kitchen on a plate that’s covered with a wet paper towel and surrounded with a plastic bag. As soon as the seeds sprout plant them carefully in a pre-moistened flat of fast-draining potting soil. Keep them damp in bright-not dark-shade; a warm shady spot with an hour of morning sun is ideal. You can also purchase papaya plants at nurseries specializing in rare and tropical fruits. The babaco papaya is a popular type because, though it’s expensive, it’s hardy to 28 degrees Fahrenheit, and the plant is small enough to grow in a whiskey half-barrel. Babaco papayas bear fruit when young, often while they’re still in a 5-gallon can, and you only need one plant to get fruit. The fruit is large – sometimes a foot long – and equal in health-giving properties to other papayas, but the cool thing is that it tastes more like a melon than like an ordinary papaya. The fruit starts to ripen between now and the fall. Pick it when it’s yellow and the skin gives slightly to the touch. When growing bananas, begin with a good variety, such as Ice Cream or Enano Giganti. (The plants are small, but the fruit is quite large.) Fertilize them often with a complete fertilizer. Bananas are big eaters. They are also thirsty, so be sure to water them well. You can keep them barely alive with less water and fertilizer in drought years, but their growth will slow down and they won’t bear fruit. As suckers, or pups, form around the main trunk, use a sharp spade to slice off all but one, and plant them elsewhere in the garden. The one pup you leave will remain to replace the mature stalk after it’s borne fruit. (each stalk of a banana plant is monocarpic and won’t bear fruit again.) At thirteen to fifteen months after planting, you should have a landscape covered with fruit. Palms can lend a tropical atmosphere to any garden, and not all are high water users; some are drought resistant. They’re incredibly interesting and varied, so before choosing a palm, study the options and your requirements. Notice that some palms have fronds (leaves) shaped like feathers and others have fronds shaped like fans. Some palms form a clump while others are solitary. Some palms are self-cleaning, meaning the fronds fall off without pruning. The fronds of others cling to the trunk after they’re dead and require pruning; in some cases the old fronds look best left on the tree. Among those with persistent fronds, some have trunks that are easily cleaned off by pruning while others have leaf bases that tend to stay on the trunk for many years. An important factor to consider if you have children is that some palms are armed with spikes while others have no spikes.